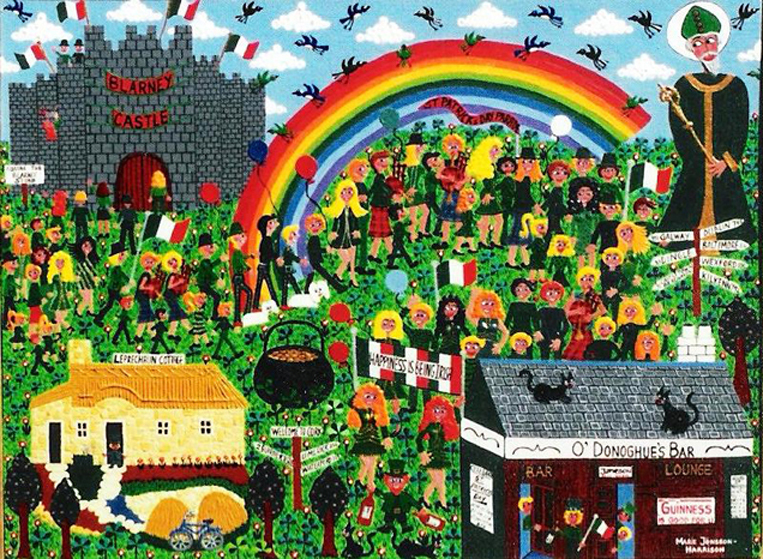 Several years ago I was commissioned to paint a St Patrick’s Day painting celebrating all things Irish by my US Art Gallery. That was something that up until then had not occurred to me and one of the reasons I generally enjoy doing commissions so much is because there is always a new topic that you may not have thought of yourself and not only does it inspire you as an artist to paint it but it also makes you grow as a person by having to research whatever the subject is. 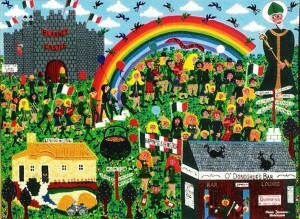 Celebrating St Patricks day in a painting! The brief for the painting was to include the St Patrick’s Day Parade, the Blarney Castle, kissing the Blarney stone, an Irish Pub, four leaf clovers, St Patrick’s the Saint, Leprechauns, a rainbow and a pot of Gold. So the above acrylic on board painting was the result. Here in Australia St Patrick’s day is taken pretty seriously as well, it is not an official holiday as it is in Ireland but there certainly is much celebration, Guinness, Irish Whisky followed by drunkenness, lol – any excuse will do for the Aussies! Well I guess there are quite a few with Irish decent here, being as Australia was started as a penal colony and many Irish along with the English came over as convicts during the 19th century. Added to this are a large number of Irish people who also emigrated to Australia later on, so there was much artistic inspiration to be had. I am not sure if in all this celebrating the fact that it is really a religious celebration is a little lost on most of us? As you can see on my painting Saint Patrick is on the top right. St Patricks day was made an official feast day in the early 17th century in celebration of Patrick who was born into a wealthy Romano-British family in AD 385 and died on the 17th March AD 461. Patrick’s grandfather was a priest and his father a deacon and he studied to become a priest, although that was after his ordeal of being kidnapped by Irish raiders and taken captive to Ireland as a slave. He apparently then had a dream where he was told by god to flee from his captors and that is what he then did in real life and returned to Britain. Later on after he had finished his studies he went back to Ireland as a bishop and is thought of as the principal champion of Irish Christianity. Originally the colour associated with St Patrick was blue but that had changed as early as the 17th century, so these days all the Irish revellers dress in green colour and you see them all spilling out onto the street from all the pubs, particularly the dedicated Irish pubs which are very popular anyway in Australia. Let’s not forget the Leprechauns either, not that I have ever seen one in real life but I have been reliably informed that they do exists and can be found at the end of every rainbow, next to the pot of gold counting their money stored away from making shoes! You really should try to catch one as they have magical powers and will grant humans three wishes in exchange for their release. They are easy to spot too as they are no taller than a small child, clad in a green coat (sometimes red) wearing a beard and a hat. Or perhaps we better just stick to the old plan of working for a living eh? Till next time happy painting, sculpting and celebrating.